Sean Maitland has been restored to the Scotland team by Gregor Townsend. Blair Kinghorn may have scored Scotland’s first Six Nations hat-trick against Italy last weekend but he’s still dropped to the bench for the game against Ireland on Saturday. 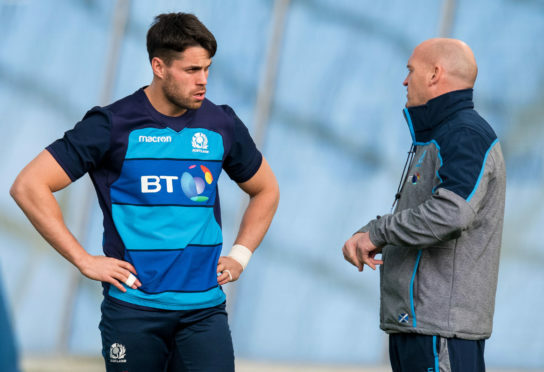 Kinghorn’s three tries were Scotland’s first in the championship since 1989 – when it was just Five Nations – but he makes way for the experienced Sean Maitland, who is returning from a hamstring problem. Gregor Townsend has made four changes to the team that beat the Italians 33-20, with Jonny Gray returning after a shoulder problem and Ben Toolis dropping to the bench. The other two changes are enforced, Josh Strauss staying at No 8 after replacing Sam Skinner early on against Italy, and Simon Berghan at tight head prop as WP Nel is out with a calf tear. Townsend also shuffles his bench, restoring Fraser Brown, Rob Harley and Peter Horne to the replacements and leaving out Jake Kerr, Gary Graham and Chris Harris. Ireland have announced a further injury in absence with Lions centre Robbie Henshaw, who played at full-back against England, ruled out and joining Gary Ringrose, Devin Toner, CJ Stander and Tadgh Beirne on the sidelines. Team: Stuart Hogg (Glasgow Warriors); Tommy Seymour (Glasgow Warriors), Huw Jones (Glasgow Warriors), Sam Johnson (Glasgow Warriors), Sean Maitland (Saracens); Finn Russell (Racing 92), Greig Laidlaw (Clermont-Auvergne); Allan Dell (Edinburgh Rugby), Stuart McInally (Edinburgh Rugby), Simon Berghan (Edinburgh Rugby); Grant Gilchrist (Edinburgh Rugby), Jonny Gray (Glasgow Warriors); Ryan Wilson (Glasgow Warriors), Jamie Ritchie (Edinburgh Rugby), Josh Strauss (Sale). Replacements: Fraser Brown (Glasgow Warriors), Jamie Bhatti (Glasgow Warriors), D’Arcy Rae (Glasgow Warriors), Ben Toolis (Edinburgh Rugby), Rob Harley (Glasgow Warriors), Ali Price (Glasgow Warriors), Peter Horne (Glasgow Warriors), Blair Kinghorn (Edinburgh Rugby).